Yesterday we noted the President's odd use of religious rhetoric. Professor Althouse slapped down one piece of that rhetoric. BARACK OBAMA, PRESIDENT OF THE UNITED STATES: These are all fabrications that have been put out there in order to discourage people from meeting what I consider to be a core ethical and moral obligation. That is that we look out for one other, that I am my brother's keeper, I am my sister's keeper. And in the wealthiest nation on earth right now, we are neglecting to live up to that call. Did you ever see a football player tackled so hard that it made your teeth hurt, just to watch it? A true and fair stroke, though. Our friend Lars Walker does not generally believe in signs and portents. I won’t go so far as to say that signs never come in our day, but I’m leery of them. Whenever I’ve thought I’ve seen a sign in my own life, it’s turned out to be an embarrassment. My church body believes that, in our time, those who have the Scriptures don’t need any further input on divine matters. Religious rhetoric from the Left: "We are God's partners in matters of life and death." Both are fairly reasonable sentiments, which is why they see use in rhetoric. The latter is a very powerful rhetorical trick in its normal usage, since it elides right past the fact that the laws aren't really interested in your body, but rather the one belonging to the child. The former admits that we normally hope to be aligned with God when we make decisions about life or death: we invoke God's blessing over births and executions. The Honorable Mrs. Bachmann actually proposes a conservative concept for health care reform during her call. It's a sketch -- you don't get detailed ideas in this kind of format. In the early 1960s, curators at the Philadelphia Museum of Art noticed something funny about one of their modern-art sculptures: It smelled like vinegar. Worse, the once-clear plastic sculpture had begun browning like an apple, and cracks had appeared on its surface. By 1967, Naum Gabo's translucent, airy Construction in Space: Two Cones looked like Tupperware that had gone through the dishwasher too often. I think I've talked about this before. Congress's approval rating sits at 30%. This is a remarkable vote of no confidence in the representative branch of a national government. In California and New York, the two most economically important and famous of the 50 states, the legislatures have been revealed as incompetent to manage the public's money. The budget crises in California and New York aren't just a normal turn in the fiscal cycle. Those governments have finally hit the wall. Oblivious to manifest failure, the liberal-progressive idea keeps itself afloat on intellectual water wings—insisting that most people still believe that if government commits itself to accomplishing a public good, it will more or less succeed despite the difficulties and inefficiencies of these great projects. Needed good gets done. That civics-book faith in the good intentions of government has been on the bubble with a broad swath of the American people who don't know left from right but only public performance. The Obama health-care proposal arrived at a particularly bad moment to be asking voters to "trust us." Wednesday's Wall Street Journal/NBC poll is disappointing stuff. It's not so much that the American people have turned against Obama's health-care reform effort as they've turned against the legislative process in general. Yes, exactly. The American people trust government with nothing. That distrust is well earned, and past due. We must solve our problems ourselves, not only without the government, but in defiance of its wish to intermesh itself with our concerns. It's 'the man in the arena,' as Theodore Roosevelt put it, that matters. He is the one fully engaged, heart as well as mind. A bureaucracy can, at best, devote only its mind. These critical, difficult questions are best solved at the lowest possible level, where the heart can be tapped as well. If you have eighty-nine cents to spend, try track nine here. If you've double that, and you want to hear a medieval drinking song worth the price, try track thirteen. "Istud vinum, bonum vinum, vinum generosum!" "Ex-Soldiers Don't Need to Be Told They're a Burden on Society"
So says the sub-title of this report, looking at "living wills" from the perspective of the VA.
Let's all factor that in to our concept of what the Obama adminstration was thinking about with its push to universalize 'end of life' planning. The AP has an odd Q&A piece on the "co-op" idea that ObamaCare advocates are floating, now that they've lost the fight to have the single-payer system they wanted, or the "public option" that was their second-best wish. The piece states that such co-ops have a "checkered" history, and that it is "unclear" if they would drive private insurers out of business. None of that is very helpful. The oddest thing to me, though, is the question about how a co-op might be better. The answer is that the co-op advocates presume it could eliminate some costs, "including profits." Profits are costs? That's a remarkably awful understanding of a basic economic concept. Profits are revenue minus costs -- they're what is left over after you've paid for everything. Taking out the profits doesn't reduce the costs, which are the same either way. You can reduce profits by increasing costs, or by reducing revenue. "But," one might object, "if you eliminate profits, you can make do with lower revenue. So, the price to the consumer is lower, because they don't have to provide profits for the co-op. It's enough that revenues meet costs, rather than surpassing the costs." That revised concept still fails to grasp what profits are for. Profits are not costs, and the wise man doesn't seek to eliminate or reduce them. Rather, profits are incentives. They encourage you to do something good for society, by providing you with something good in return. We want health care, right? Therefore, when someone offers to provide us with health care, we want to make it worth their while. If we do that, more people will want to provide health care. They will be smarter people, too, the sort of people who could choose to do something else instead. That's good for everyone. Profits are also responsive. Mark Steyn's point in his piece below was that, in a for-profit system, if your hospital isn't clean you can move to the one down the road. In the mandated, socialist system, that's not an option. Even if it were, though, why would the one down the road be any cleaner? There's no money in it. In America, being the cleanest hospital could quickly become a point of competition if attention were focused on it -- a competition leading to rapid improvements. Lacking profits, the only way to motivate people is through negative consequences. If there's no positive incentive, you're left with regulations, punishments, and drafting unwilling people into service. You have a stick, but no carrot. Profits are not costs. They're incentives. They're good. We should want more of them. The Atlantic has an article that blames a father's death on the American health system. Almost two years ago, my father was killed by a hospital-borne infection in the intensive-care unit of a well-regarded nonprofit hospital in New York City. Dad had just turned 83, and he had a variety of the ailments common to men of his age. But he was still working on the day he walked into the hospital with pneumonia. Within 36 hours, he had developed sepsis. Over the next five weeks in the ICU, a wave of secondary infections, also acquired in the hospital, overwhelmed his defenses. My dad became a statistic—merely one of the roughly 100,000 Americans whose deaths are caused or influenced by infections picked up in hospitals. One hundred thousand deaths: more than double the number of people killed in car crashes, five times the number killed in homicides, 20 times the total number of our armed forces killed in Iraq and Afghanistan. Another victim in a building American tragedy. Oddly enough, that was precisely Mark Steyn's complaint with the Canadian health care system. My father is currently ill, and the health "system" is doing its best to ensure it's fatal. When an ambulance has to be called, they take him to a different hospital according to the determinations of the bed-availability bureaucrats and which facility hasn't had to be quarantined for an infection outbreak. At the first hospital, he picked up C Difficile. At the second, MRSA. At the third, like the lady above, he got septicaemia. He's lying there now, enjoying the socialized health care jackpot — C Diff, MRSA, septicaemia. None of these ailments are what he went in to be treated for. They were given to him by the medical system. Now, the first fellow says that those 100,000 deaths are "caused or influenced" by secondary infection. That "influenced" muddies the waters quite a bit. We don't know how many of those deaths are from the infection, versus from the original disease (with the infection just 'influencing' the course of that disease). This study shows that the Canadian system infects 250,000 people a year with diseases. It lists only 8,000 deaths caused by those infections -- but it doesn't say how many are "influenced" by the infections. It's quite possibly rather more than 100,000. The solutions being proposed in both cases are remarkably similar: clean your hands. Go through a basic checklist to make sure instruments are clean. A fair number of doctors aren't doing it in either country. The problem isn't the payment system, then. The problem is the fact that hospitals collect people whose immune systems are already taxed by one disease or injury, and expose them to many other people with different diseases, many infectuous. The problem is that a number of sanitary techniques are not fully implemented. The Atlantic asserts that a government-run system would do it better, but the evidence suggests that there is no reason to believe that is the case. 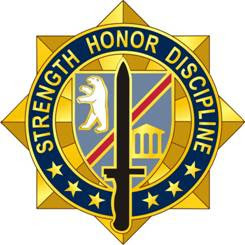 Perhaps the Army's newest unit heraldry -- technically, it isn't even active yet, since it's approval date is not until 16 October, 2009 -- was designed by a friend of mine. The 2nd Brigade Combat Team, 1st Armor Division, reflagged as the 170th Infantry following their recent mission in Iraq. A new 2/1 AD will stand up here at home. The soldiers of the old 2/1 AD ("Iron Brigade") remain forward-deployed in Germany. Designing the new distinctive unit insignia was one of very many tasks handled by a certain lieutenant I could name (who was a captain by the time he left). As tasks go, I thought that was a pretty cool one. A new PETA billboard campaign that was just launched in Jacksonville reminds people who are struggling to lose weight -- and who want to have enough energy to chase a beach ball -- that going vegetarian can be an effective way to shed those extra pounds that keep them from looking good in a bikini. "Trying to hide your thunder thighs and balloon belly is no day at the beach," says PETA Executive Vice President Tracy Reiman. Yup, I think that's going to convince people. Really. Dennis, over at Dennis the Peasant, has been laid up of late, and is using his convalesence to blog up a storm, principally on the failure that the Obama administration is becoming. Remember the anti-war movement? Not too long ago, the Democratic party's most loyal voters passionately opposed the war in Iraq. Democratic presidential candidates argued over who would withdraw American troops the quickest. Netroots activists regularly denounced President George W. Bush, and sometimes the U.S. military ("General Betray Us"). Cindy Sheehan, the woman whose soldier son was killed in Iraq, became a heroine when she led protests at Bush's Texas ranch. I remember the same sort of thing happening after the abolishment of Apartheid in South Africa, too. Not the cold, as you'd expect, but the sea threatens the oldest city in the North. The city was abandoned five thousand years ago: a thousand years before this extraordinary find of an early British hero. The carved capstone had sealed the grave so well that organic materials including wood, bark and leather survived intact as well as various metal objects. The man, who is believed to have been an important figure, had been laid out on a bed of quartz pebbles in sand, in a birch coffin, inside a larger stone chamber. He was buried with a valuable bronze dagger with a gold band — still in its leather sheath. There was also evidence of the remains of wooden possessions and floral tributes. Whenever you find soft, organic material in one of these sites, it's exciting. To find it from four thousand years ago is amazing. I'm working on a piece on Federalism v. Progressivism; self-described "progressives" seem to be the chief enemy of the idea of pushing government down to lower levels. As that solution allows people with fundamentally different ideas about right and wrong to live in peace, it's a difficulty for a divided nation. Self-identified conservatives outnumber self-identified liberals in all 50 states of the union, according to the Gallup Poll. The 2008 exit poll, showing a disaster for Republicans, had a conservative advantage by 34/22. Now, if only there were a conservative party. Speaking in defense of my status as a lifelong Democrat, by the way, I'd like to point out that the effective opposition to the health care bill is largely coming from conservative Democrats. I've seen a few Republicans trying to claim credit, but the only one who seems to have done anything demonstable is Mrs. Palin -- now retired to private citizenship. The guys who are actually forcing the change in the policy are wearing D's. I don't know what I like better about this story: the second photo, or the comment by Woz from York. In the comments to a post below, a commenter called "RV" stated that "Emmanuel is the new Ayers." Both Ymar and I objected to the characterization, and for good reason. Ayers was a terrorist, and to this day remains an unrepentant and proud one. Knowingly associating with him is a black mark on anyone's character, because he is an enemy of us all. The fact that he escaped judgment is not due to his lack of guilt, which he confesses -- proclaims! -- freely; and wishes only that he might have "done more" of the bombing and killing on which he built his name. Dr. Emmanuel -- who states, Mrs. Palin noted in her piece, that his 'thinking has evolved' since his piece on rationing became public -- is someone who has a philosophy with which we disagree. He arranged for a friendly journalist to provide his version of the business here. The issues are laid out precisely as the Doctor -- and the President -- would like them understood, without questioning of any sort; but we've seen the other side, so read theirs also. A final aside: I didn't realize he was Rahm Emmanuel's brother. I knew the Obama White House was a Chicago Way operation, but I didn't know it was quite that... ah, close-knit. Or perhaps it's just more of that Obama luck, that his chosen medical advisor just happens to be his chief of staff's brother. The President has moved in very small circles here in America: the Ivy League, the Chicago machine, not much else. In the last days of my second tour in Iraq, I found myself with a sudden excess of time on my hands. I was done; all that remained was shipping myself home, giving a few last 'lessons learned' lectures on the way. Where there had been fifteen to eighteen hour days, though, I suddenly had a few hours each day to myself. At the MWR, looking for anything at all to read, I saw a little yellow book called The Knight, by an author named Gene Wolfe. I normally cannot abide fantasy novels written after the death of Fritz Leiber; but it turns out that Gene Wolfe is of an age to still be writing good old fashioned ones. That is to say, they are books that have the courage to believe in what they are telling you. As a child I had been taught a code of conduct: I was to be courteous and considerate, and most courteous and most considerate of those less strong than I -- of girls and women, and of old people especially. Less educated men might hold inferior positions, but that did not mean that they themselves were inferior; they might be (and often would be) wiser, braver, and more honest than I was. They were entitled to respect, and were to be thanked when they befriended me, even in minor matters. Legitimate authority was to be obeyed without shirking and without question. Mere strength (the corrupt coercion Washington calls power and Chicago clout) was to be defied. It might be better to be a slave than to die, but it was better to die than to be a slave who acquiesced in his own slavery. Above all, I was to be honest with everyone. Debts were to be paid, and my word was to be as good as I could make it. A story that conveys that artistically is indeed a thing of beauty. This is what the old sort of writing was about. The dragon might be legendary, but the virtues were as real as stone.